In the 1980’s, pregnant officers were allowed to work full duty. One officer was assaulted on patrol, and miscarried. This made it clear to me that a pregnant officer was a greater target in a potential assault situation. 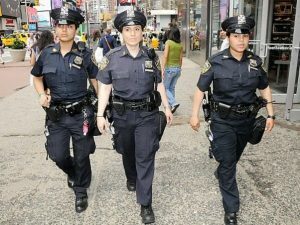 The NYPD agreed that pregnancy would automatically place an officer in a non-hazardous and non-uniform position for the duration of the pregnancy. This caused another problem. No officer on restricted duty could be promoted by regulation. Therefore, a pregnant officer was denied promotion to sergeant in spite of her outstanding performance on the sergeant’s exam. I thought this absurd since pregnancy was obviously temporary and not an illness. I then argued with the chief of personnel who stood his ground. The president of the Policewomen’s Endowment Association, at the time, took up the fight. After some litigation, the officer was promoted and given back pay and sergeant status. Any police officer who went sick five times in a year or 40 days was placed on chronic sick. This was a classification that severely restricted privileges while out sick and allowed “absence control” officers to visit one’s home. Early in my career, I was in charge of the chronic sick. Looking over the roster I saw a predominance of females, all of whom had gone sick during pregnancy. Agitating the powers in charge, I eventually excluded pregnancy related illness as counting towards chronic sick. So what should you do with a pregnant cop? Here is an article I came across recently. Eventually, one of the district surgeons (in a group of over 30) was a gynecologist who could more properly deal with pregnancies and pregnant officers became grouped separately in a pregnancy district, although generally officers are assigned to surgeons based on their residency zip codes. Widows of slain police officers were not permitted to remarry without losing the death benefits of their husbands’ pensions until Governor Mario Cuomo changed the statutes. I personally accompanied three police widows to his office with the assistance of one of the governor’s lawyers. Introducing them by saying that these women are expected to marry until eternity, since if they marry after the death of their husbands, they lose the pension, the governor was astounded. He quickly worked with the legislature in New York to change the law and the survivors retained their benefits when they remarry. Once again other jurisdictions have wrestled with this problem. Someone needs to tell this to the UK. If any of this peaks your interest, you can find more of these stories in my book.